2in. Diameter (max. 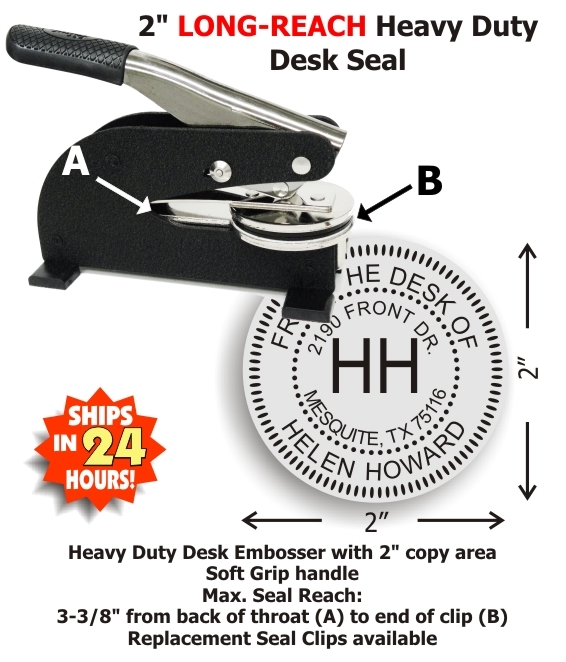 impression area) Heavy Duty Long-Reach Desk Style Embossing seal from Shiny®, USA. New feature allows online customization of a standard MONOGRAM design. Extremely heavy guage metal and sturdy rubber feet provide a superior platform for high volume embossing jobs. Longer die holders provide greater leverage than the standard desk model and require less effort, even when embossing on thicker paper. Long-reach throat allows for an impression reach up to 3-3/8in. from edge of paper to top edge of seal impression. Normal production time - 24-48 hours (excludes weekends and holidays). Please note: While this product (SL-LREH.2) allows text customization to be previewed online, it is not intended for use of custom logos or artwork. To upload an art file or custom logo, please use the LOGO version of this same product (SL-MNLR.2) by CLICKING HERE.